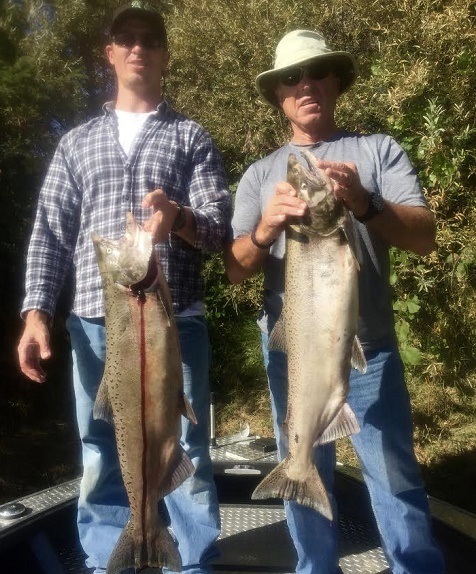 Sac River fall steelhead fishing picking up! Jeff Goodwin with one of many wild steelhead he caught this week, by Jeff Goodwin Jeff Goodwin with one of many wild steelhead he caught this week. Last week's storms brought some of our first significant rainfall totals to the foot hills and valley here in the Redding area. Rainfall is always welcomed this time of the year, especially with 4 years of drought that is still haunting the region. Local lakes have seen level increases and tributaries continue to provide a slow, but steady, amount of run off. Both Whiskeytown and Shasta Lakes look great, and the Sacramento River is holding its own with a steady supply of water coming in from all directions. 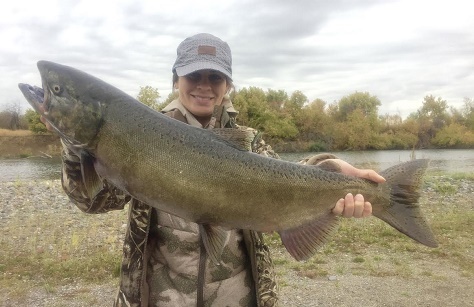 One of the best fishing opportunities on the Sacramento River now includes the hatchery steelhead run and wild trout fishing. With a fresh shot of dirty water in the Sac, both fall run salmon and steelhead have started to show up in good numbers in the river above Red Bluff. 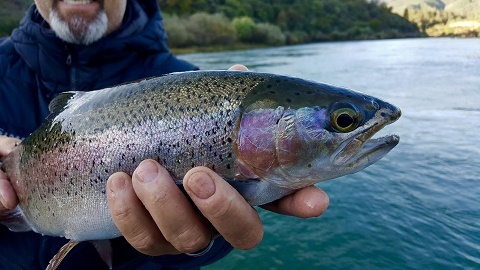 In addition to these new fish in our area, spawning salmon are providing the annual "egg drop" bite and the resident rainbows are currently locked in on spawning salmon waiting for a chance to gorge themselves on protein rich salmon eggs. This can be one of the best times of the year to get out and chase these steelhead and trout in the Redding to Red Bluff area. There are sections of the river now that are literally stuffed with these actively feeding fish and it can make for a great day of fishing with double digit hook ups being the standard. I've had limited opportunities to get out due to a family vacation and a boat thats up at Willie Boats getting some upgrades, but that's ok because this fishery is just getting good! I've been eagerly anticipating my upcoming "late fall" season and will be running trips on the Sacramento River again beginning 11/15. I still have openings available, but I'm booking a trip every few days now so booking sooner than later is recommended. Not only will we be catching numerous steelhead and wild trout, I will be running trips for the late season King salmon as well. It's a smaller run than the summer/fall run, but the quality of these salmon makes the cold mornings and slower action worthwhile. Bigger, brighter King salmon make this run of salmon something special for sure. In addition to favorable water conditions currently, it should be noted that the 2013 class of "late fall" Coleman Hatchery salmon smolt were NOT trucked to Rio vista in 2014 and we will not lose these fish to "straying" like we did with our early season salmon. Time will tell, but this could be a great finish to the 2016 salmon season for us up here in the Battle Creek area. So in wrapping up this week's report, look for some good-very good steelhead/wild trout fishing on the Sacramento River this week! With that being said, here are a few tips for success; Find the spawning salmon and you'll find steelhead/wild trout. Fish the shallows, not the deep sections of the river. Finally, match the hatch! Steelhead/wild trout are eating salmon eggs. Cured roe, Glo Bugs, and 8mm-10mm pegged (egg color) beads will catch you fish! 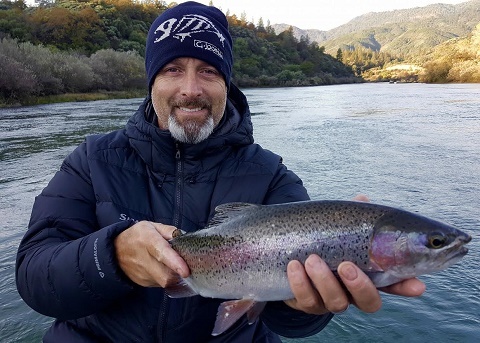 Jeff Goodwin is a full time Northern California fishing guide. He guides year round for salmon, trout, steelhead, Kokanee, and bass on Northern California rivers and lakes. He fishes many bodies of water in the Redding area, but also guides the Sacramento River and Feather River during certain times of the year. Jeff can also be found on the California coast chasing ocean fresh King salmon and steelhead each year. To learn more about the fishing trips Jeff has to offer, please visit Jeff Goodwin's Guide Service. You can also find him on Facebook, Instagram, and Twitter, or please feel free to call him anytime at (707) 616-1905. Fall fishing remains full of opportunities!